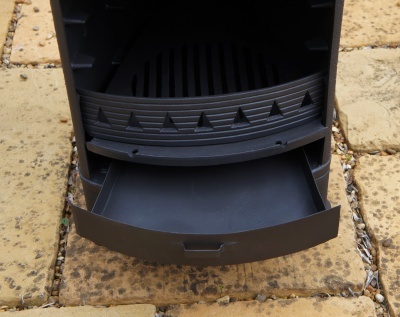 The Hellfire Outdoor Cast Iron Stove / Bbq is a convenient and extremely portable cast iron patio burner which is multi functional and doubles as a barbecue. It is also ideal for camping as the burning is completely contained. 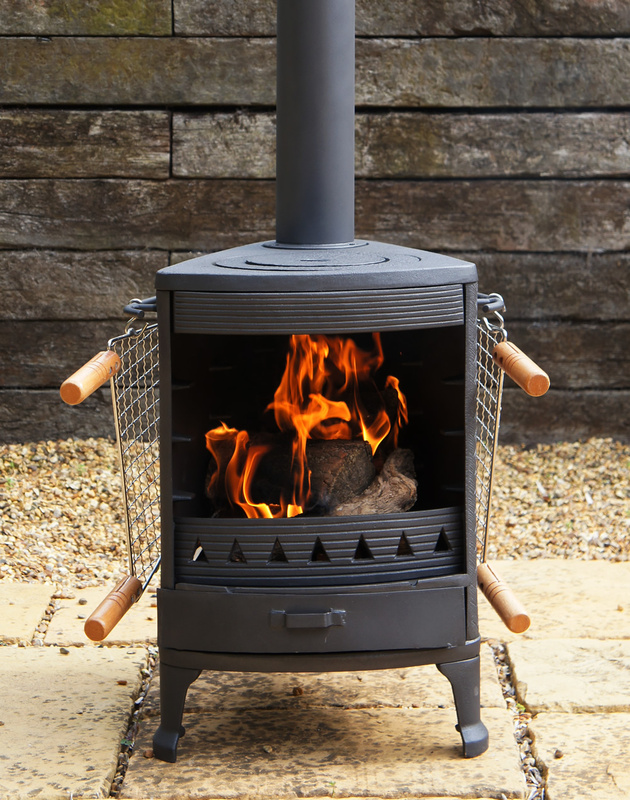 Use it as an outdoor chiminea / log burning patio heater burning logs. 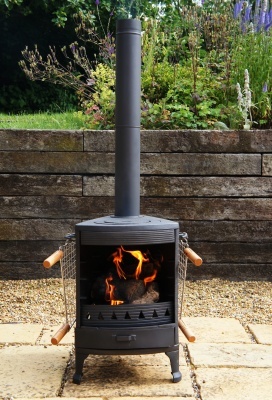 At the same time, you can boil a kettle on top or use the provided griddle plate and cook a steak or two ! Being cast iron, it absorbs the heat and stays hot for ages. 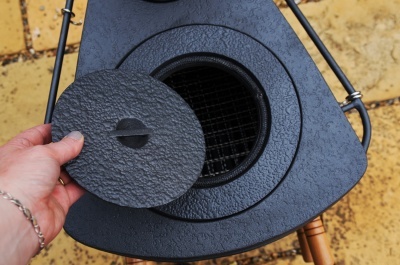 Use it with charcoal as a bbq, using the two internal wire racks provided. The racks are surprisingly spacious and you can get loads on them. There is a 3rd height in the inside - so you can purchase an extra rack if required. We have successfully cooked pizza inside of this unit as shown - by placing a pizza stone (not included) on top of a rack when burning wood. Make sure to give the stone a good amount of time to heat before baking. 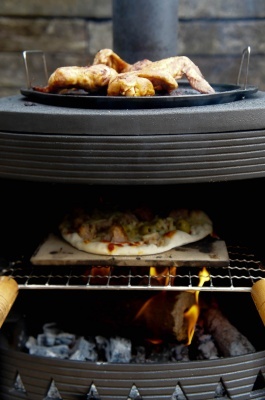 7" and 9" Pizza paddles and stones can be found in our ebay shop should you require them. There is an ash pan drawer at the bottom to facilitate easy cleaning access. an interchangeable solid top with 2 different size hot plate rings that may be used with a pot or kettle (not included) and a grill / griddle plate* for cooking directly over the flame. 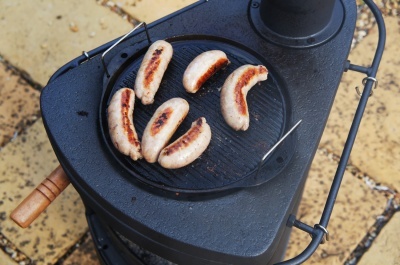 A griddle plate - this can be used either or top of the burner in place of the centre rings (ideal for cooking on when using appliance as a patio heater and burning wood) or inside the appliance on top of a rack when burning charcoals and bbq'ing. 2 x flue sections. These just slot together over the outlet on the burner. 2 x hanging rails - these bolt on to the side of the unit. Use them to hang your bbq tools or cooking racks perhaps ! This unit requires some minor / simple assembly. You will need to screw on the legs, outlet collar and side rails. 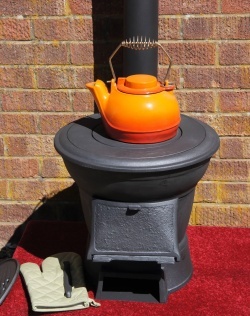 ** Don't forget that it is the nature of cast iron to rust outdoors if left unprotected. I actually like that - I love the patinsition of cast iron once the surface gets a chance to rust.You can respray or paint if ever needed to give additional protection. 4" diameter, in two sections - totalling approx 800mm long.